HandlePod serves a variety of uses. Camera stabilization for low light photography and shake free video is the reasoning behind HandlePod. This unique tripod alternative serves multiple functions. It is a handle for improved stability when shooting hand held. It attaches securely to support objects with the supplied elastic cord. Its unique feature is the ability to hold it comfortably by hand against any solid support for dependable camera stability. The supplied elastic cord guarantees solid, dependable attachment. Try it on your car’s rear view mirror to make an awesome car cam. Most vehicles have some part where you can attach a HandlePod. Examples include ATVs, race cars, motorcycles, hang gliders and so on. Use duct tape to mount HandlePod to a wall, door or any large object when you don’t want to hold it in place with your hand. Slap a strip of tape across the handle and press it firmly against the support. This works best with small cameras or phones, but be sure to test adhesion first. A C-clamp can also be used to attach it to any thin flat object. Extra stabilization for hand-held shots can make the difference between a super-sharp exposure and one ruined by camera shake. 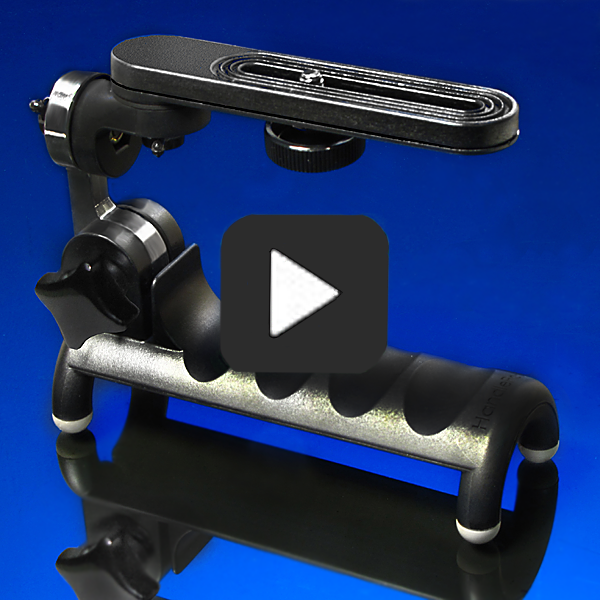 HandlePod provides the advantage of a solid grip and added leverage to minimize blur. But for additional hand-held stabilization it’s easy to add a length of string to create an instant “stringpod”. Just slip a length of 1/8 inch nylon cord into the slot on the HandlePod, stand on the other end and pull up to create tension. This provides an added measure of stabilization that can make all the difference. There are many on-line articles dealing with low light photography. All of them recommend using a tripod as the primary defense against blur from camera shake. But if no tripod is available, HandlePod can make the difference between a tack-sharp low light photo and one ruined by camera shake. This entry was posted in Camera Stabalization, Hand Held Stability, Low Light Photography, Shake Free Video, Tripod Alternative on March 11, 2015 by main user.